Vrocks have been in D&D for a long time now. They look like humanoid buzzards, covered in dirty feathers and the occasional spike. A pair of functional wings sprouts from their back, and they have lizard tails. They're on both the MM and the MV. Vrocks have Int 12 but that doesn't see to do them any good. Vrocks are famously disloyal even among demons, betraying their current master as soon as someone they see as stronger comes around. They'll also frequently plot to overthrow their superiors, though those schemes rarely amount to anything. In other words, Vrocks behave just like Starscream! I can totally see a band of them pledging loyalty to the PCs during an adventure, pinky-swearing they'll turn good, and backstabbing them in the worst possible moment. The PCs ḱnow it's coming, and the vrocks know the PCs know. How far can the PCs take this alliance before it falls apart? Aside from plotting and backstabbing, vrocks like to engage in wholesome demonic pasttimes such as tearing people to pieces while laughing maniacally. 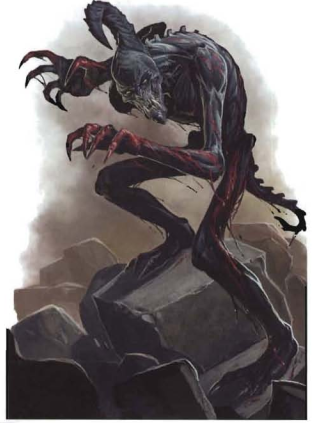 The MM Vrock is a Large Elemental Humanoid (demon), and a Level 13 Skirmisher with 132 HP. It has darkvision and variable resistance 10 (2/encounter). It flies with speed 8 and moves on land at speed 6. Its basic attack is a Reach 2 claw, and they can make a Flyby Attack where they fly their speed and make a claw attack at any point along the way. This doesn't provoke opportunity attacks from the target of the claw. They can also let loose a Stunning Screech that recharges on a 6, targets the Fortitude of everyone on a Close Burst 3 and stuns affected targets for a turn. This is not a selective attack, so the vrock's allies can potentially be affected by it! When first bloodied, the vrock emits a cloud of Spores of Madness in a Close Burst 2. This targets the Will of any non-demons in the area, does poison damage, and dazes (save ends). So I guess this is what they have instead of blood? The MV Vrock loses its Stunning Screech and has fixed damage math, but is otherwise identical. I thought I was in for another bland rage machine, but what I got was Vulture Starscream! They're nifty. I'm a bit divided on the removal of the Stunning Screech in the MV update. On the one hand stuns are rough, and non-selective area attacks are a pain for your teammates. On the other hand it captures the vrock's Chronic Backstabbing Syndrome so well! 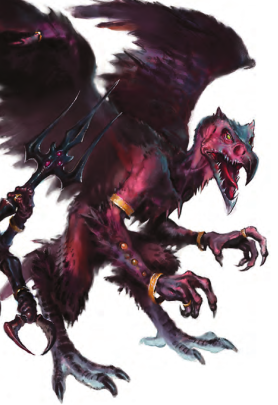 Abyssal Eviscerators first show up in 4th Edition in the Monster Manual 2, but since they're also in the Monster Vault we're getting to look at them a bit early. The name says it all, really. Abyssal Eviscerators come from the Abyss, and they like to eviscerate. At Int 7, they don't know how to do much else, but then again they don't want to. They frequently find themselves under the command of stronger demons, or summoned by mortal demonologists of middling skill and above. Abyssal Eviscerators are Medium Elemental Humanoids (demons), and Level 14 Brutes with 173 HP. The MM2 and MV versions are identical aside from the fixed math. They have Speed 5, Variable Resistance 15 (2/encounter), and no special senses. Their basic attack is a claw, and they can also Grab at-will for slightly less damage, an attack which obviously starts a grab if it hits. The MV version specifies the demon can only grab at most two creatures at once, which is sensible because it only has two large hands. Abyssal Eviscerators can also bite grabbed targets as a minor action, doing 6 automatic damage to them. They can only do this once per round normally, but can do it up to 3 times per round while bloodied. Nothing special here, really. These guys are basically paragon-tier evistros and should be used in the same way. 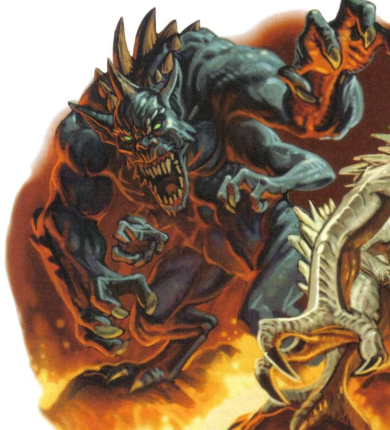 I’m always surprised how little 4e’s original demons (Is this one of them?) lean into the “horrid beast-men” aspect, considering it’s the first edition that sat down and said it. The eviscerator’s got digitigrade legs and a face that could be called bat-like, but is otherwise a spikey-skinned humanoid, which is usually the devil aesthetic. Everything about "abyssal eviscerator" says "created for the D&D Miniatures game" to me, though I dunno if it's 3e or 4e. Probably 3e. 3e monsters go for kind of that Wayne Barlowe approach of trying to make monsters look evolved rather than chimerical, which didn't stick super well (the 3.0 marilith illustration attempted to make her human parts much less humanlike, and that interpretation didn't last very long). Maybe they were trying to give this guy a family resemblance to the balor? But yeah, I like demons chimerical. I'd rather have something resembling the original piscodaemon's outrageous look than the abyssal eviscerator any day. I like mine more outre. Juiblex was always one of my favorites. We're almost through the Demons... but not through the D's, oh no. In fourth edition, the Babau first appears on the Monster Manual 3. We're viewing them ahead of time because they also appear on the Monster Vault. The general thrust of demons in 4e is that they're not fond of complex schemes, which are more of a devil thing. Babaus are one of the exceptions to that rule. You see, there's this demon lord called Graz'zt who is not a former primordial like the other demon lords. Instead, he was an archdevil who got it into his mind to invade the Abyss. Why did he do that? I don't know. The lore in the MM3 mentions the Blood War, but I didn't think that was still a thing in this edition. Maybe it's a vestige of his backstory from Planescape, or maybe the Blood War has a different explanation for its existence here. Anyway, shortly after getting to the Abyss, Graz'zt was corrupted by the seed of evil and decided to stay around and become a demon lord. Glasya, another archdevil and daughter of Asmodeus, was not pleased by that. She went after him and ran him through with her sword. When the drops of blood from that wound hit the ground of the Abyss, they became babaus, and their number was so great they drove Glasya back to the Hells, and their continued presence helped build Graz'zt's power base and make his claim to demon lordship stick. Being the spawn of Graz'zt, babaus are extraordinarily subtle and cunning for demons. This means they like to kidnap people to torture later instead of killing them all right away. They can be found working alongside other demons, even though they're even less trusted than usual due to their continuing loyalty to their creator. They look like skeletally thin humanoids with dark gray skin coated in slime, a spine-like tail, and a weird horn that looks like a scorpion stinger growing out of the back of their heads. All of this in addition to the usual demonic claws and fangs. Since the babau is from the Monster Manual 3, its stats are identical in that book and in the Monster Vault. It's a Medium Elemental Humanoid (demon), and a Level 13 Skirmisher with 127 HP. They run with Speed 7. The babau has acid resistance 5, plus variable resistance 20 usable 2/encounter. It's coated in acidic slime that deals 5 acid damage to anyone who attacks it with a melee attack. This demon has two basic attacks, a bite and a claw. It can only use one of them per standard action, unless the target is granting combat advantage. Then it can use both. Each attack only does about half the level-appropriate damage for a skirmisher by itself, so the babau should really strive to gain combat advantage when fighting. The bite also does 5 ongoing acid damage, or 10 if the demon is bloodied. As a minor action, the babau can perform a Murderous Abduction. This teleports an adjacent creature up to 7 squares and then immediately teleports the babau next to it. The victim grants combat advantage to the babau for a turn. This recharges whenever the babau drops someone to 0 HP. I'm guessing it reserves the power for then a PC is close to dropping. I'm gonna have to go with "meh" on this one. I'm not a fan of Graz'zt. The whole babau backstory feels kinda shoehorned in. They somehow brought back the Blood War and Graz'zt, something which I feel was completely unnecessary. I was never a fan of Mr. Apostrophe. As for the babaus themselves, they seem a bit too hard to use properly, since they absolutely must gain combat advantage to do level-appropriate damage with their attacks. The abduction power makes it seem that they'd be best employed in terrain with obstacles that are hard to overcome without teleportation, but then they can't teleport back even if they drop the abducted PC. And if the PC doesn't fall on that first turn, then the demon is now stranded far from its own allies and together with an angry PC. In this case, I’m fine with the lack of animal features due to their unique origin. Interestingly, this backstory is repeated almost word-for-word in the 5e Volo’s Guide, minus the familial relationship between Glasya and Graz’zt. Graz’zt also remains a defected archdevil across editions. Oh wait, I misread the book! Glasya is not said to be Graz'zt's daughter in the MM3, she's still Asmodeus' daughter. I'll fix the post. I'll always be favorably inclined towards Graz'zt simply because of his place as one of the central villains of Tales of Wyre. That said, this babau does seem rather unintimidating.